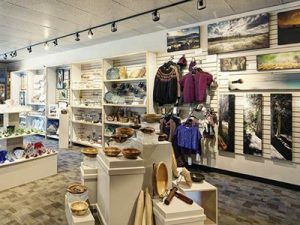 Village Arts located in the Columbia Valley in Invermere, BC offers fine contemporary and traditional craft in pottery, glass, fibre, metal, photography, fine art and more. Forty-five artisans are featured in the Village Arts store. All work is selected through a jury process and is made by members of Village Arts. The Village Arts members are a diverse group including internationally known artisans, mid-career artisans and emerging artisans from across Canada. Several distinct potters create in earthenware, porcelain and Raku. Exquisite jewellery from lampwork glass and fused glass, unique earring and pendants. Wearable art in the form of scarves, bags and jackets. Home décor crafts include metal work, blown glass, candleholders or unique cushions. Colourful children’s clothes, toys and more. Photography, fine art prints, paintings, sculptures, soap, and preserves round out the extensive collection of work at Village Arts. Looking for Local & Handmade? Find the crafts of over forty-five exceptional Canadian artisans. Village Arts has beautiful handcrafted items suitable for every occasion and budget. Village Arts has beautiful handcrafted items suitable for every occasion and budget.